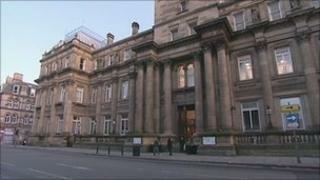 A government minister has accused Liverpool City Council of being slow to respond to its budget crisis. Councillors are due to meet on Wednesday to discuss how to find £91m worth of savings in the coming year, with the loss of hundreds of jobs. Speaking in the House of Commons, Tory Local Government Minister Grant Shapps said many cuts may have been avoided had the Labour council acted sooner. Labour MP for Wavertree, Luciana Berger, rejected the claim. Mr Shapps, Minister of State for Communities and Local Government, said: "Nobody says that this is going to be easy. "Liverpool is latterly doing something about it, the problem is that they weren't planning for this far enough in advance. "Had they been doing so, then they would have been in the same position as Trafford and other local authorities who are doing these reductions without some of the pain which is now being experienced in Liverpool." The council has announced a package of cuts in its budget for the coming year. It is set to cut half of its senior management posts, saving £4.5m, and has said the predicted figure of 1,500 job losses has been reduced to 1,200. But funding for voluntary groups has been cut by £18m, a figure which represents almost 50%. Ms Berger said: "Independent efficiency expert Colm Reilly, of PA Consulting, has said that given the huge government funding cuts, the council cannot actually make the scale of savings that they have to make without affecting frontline services." Liverpool Council Leader says cuts are "heartbreaking"